I am currently working on my project - Crystal Mines. The idea is to create a cave where some kind of metal ore is being mined. And this cave has glowing crystals to make it all pretty-looking. First, I tried to create the cave using a bunch of huge chunks of rocks, using them as walls. But I didn’t really liked the result. Some parts are unfolded slightly unevenly, but who cares - it’s a rock texture anyway. There are couple areas near the bottom of the mesh, however, that have pretty nasty stretching. Mainly, they do not cause too much problems - I used decals to hide seams between floor and walls and ceiling. So they cover up the stretching of underlying textures. The first obvious solution that comes to mind is to make some cuts on UV’s, so that they could be unwrapped better. 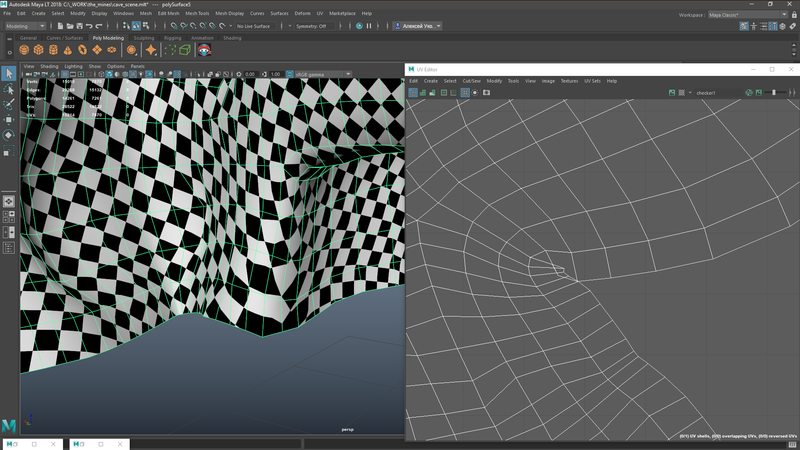 But the problem is - it ends up messing tessellation, leaving holes and lighting artefacts on texture seams. I tried to manually tweak the UV’s in this area, but to no satisfactory results - this spot is just way too messed up. Is there anything that could be done here to mitigate the stretching? I’m looking for any advice.